The Lenovo Twist has a conventional design that can allow it to be used easily as a notebook or as a tablet. It has a decent configuration and a useful set of built-in features, but it's not without its problems. Our review unit had poorly performing sensors that couldn't get the screen orientation right, along with some other niggling issues. Lenovo's primarily business-focused ThinkPad Twist (type 3347-3EM) is a hybrid Ultrabook that is built in the same form as traditional Windows tablet PCs. It incorporates a central hinge design that not only supports the screen, but also allows it to swivel and fold back down over the keyboard so that it can be used as a tablet. It's a tried and tested convertible design on an Ultrabook that also features a decent configuration and connectivity options. However, we did experience some issues while using this unit that left us unimpressed. At 12.5 inches, the size of the Twist is small and perfectly suited to mobile users. It's 23mm thick (taking into account the rubber feet on the base) and it weighs just under 1.6kg, but it doesn't feel quite as heavy when it's held. It's a well balanced unit that's mostly sturdy and it has a spill resistant keyboard in its base, as well as scratch resistant Gorilla Glass in front of the screen. The style is a little too flashy for a ThinkPad model though — we could do without the chrome trim along the screen's edges, which feels cheap, as well as the glossy finish of the bezel. The edges of the Twist's base provide real estate for a few useful ports: USB 3.0 (two of them), Gigabit Ethernet, Mini DisplayPort, Mini HDMI and a combination headphone/microphone port. There are also two slots: one for a full-sized SD card, and one for a SIM card, the latter of which can be used in conjunction with an optional 3G modem to supply mobile broadband. It's a thin base that also contains a fair configuration, which includes an Intel Core i5-3317U CPU with Intel HD 4000 graphics, 4GB of DDR3 SDRAM and a 500GB hard drive, as well as a 24GB solid state drive. Because it has a mechanical disk drive in addition to a Core i5 CPU, it does tend to get fairly warm. It can become uncomfortable to rest it in your lap while using it as a notebook, or while holding it as a tablet. The left side of the chassis has a SIM slot, an SD card slot, a Gigabit Ethernet port, a Mini HDMI port, a USB 3.0 port and a headset port. The right side has another USB 3.0 port, a Mini DisplayPort, the power port and the air vent. You can also see the power button and the screen auto-rotation lock button. 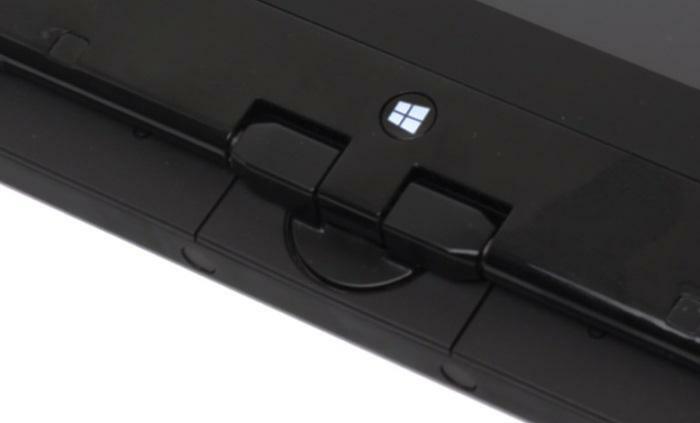 The central hinge allows the Twist to be converted into a tablet with ease. As a tablet, it can be quite enjoyable to use. Its screen is capacitive, supporting up to five simultaneous inputs, and its resolution is 1366x768. The screen is easily viewable from different angles thanks to Lenovo's use of an IPS-based panel, but reflections can be a problem due to the Gorilla Glass. It proved to be a responsive and accurate screen, which allowed us to easily click on items and drag information around on the screen, but we wish that Lenovo incorporated a digitiser pen to aid handwriting recognition and drawing. The screen has only a few physical controls on it: you get a tactile Windows button and volume controls on the bezel, and there is a power button along with a screen auto-rotation lock on the bottom-right edge (the power and lock buttons don't feel good to press). Using the Twist as a tablet, we noticed that its screen orientation sensors worked to detect the way in which we held the screen — although they were sometimes sluggish in their response. But we also noticed a problem: when we wanted to go back to notebook mode, the auto-rotation sensor failed us many times. The screen would often stay upside-down or sideways and the only way to fix it would be to restart the computer (not simply close and open the lid, but actually restart) or swing the laptop around in a figure-8 motion to reset its sensors — a physical task that laptops are not designed for. There were also times when the screen changed orientation on its own even when we used the Twist as a laptop on a desk. This errant screen orientation caused us to enable the auto-rotation lock so that the screen orientation would stay put. It's a problem that made using the Twist frustrating when it occurred and we couldn't find a way to properly remedy it. Disabling and re-enabling the sensors made no difference, and there weren't any updated drivers for the sensors on Lenovo's Web site at the time of writing. We imagine it would be quite embarrassing if you wanted to use this laptop to give a presentation to a small group of people and all of a sudden the screen didn't stay the right way up. Hopefully it's only a quirk that's present only on our test model. In light of this problem, one thing the Twist could use is a manual screen rotation button. The auto-rotation sensors did not work properly when we converted from tablet back to notebook mode. Sometimes the screen changed orientation automatically even when the laptop was sitting unmoved on a level desk. There are other sensors in this Ultrabook that seemed to work properly though. The display's ambient light sensor dimmed the screen only when we took the laptop into a darkened room and then turned up the brightness again when we entered a better-lit room. There is a motion sensor for the installed hard drive, too, and this will attempt to protect the drive from being damaged by excessive movement. It's set to be quite sensitive by default and even slight movements while we were playing a video file off the drive made the video freeze. As for the Twist's performance, it is generally very good. Its configuration put up expected results in our Blender 3D and iTunes MP3 encoding tests (49sec and 1min 1sec, respectively, which is on par with other 3317U CPU-based Ultrabooks such as the Samsung Ativ Smart PC Pro), and it showed that it could be used for relatively tough tasks such as encoding video files by taking just under 14min to turn a DVD file into an MKV file in Arcsoft Media Encoder 7, and 20min to turn a DVD file into an MP4 using Handbrake. The Twist's integrated graphics are good enough for the everyday running of the machine and they will also allow you to play many games that have been downloaded from the Windows store. You won't want to run many 3D-intense desktop games on this Ultrabook though — it's not designed to run them. This was confirmed by a result of 4059 in 3DMark06. As previously mentioned, the Twist can get uncomfortably warm when its processor is putting in hard work, and this is exacerbated a little by the mechanical hard drive that has been installed in this unit. The drive is a 500GB version of the 7mm thick Hitachi Travelstar Z7K500, which has a usable capacity of 455GB and a spin speed of 7200rpm. Its results in CrystalDiskMark were impressive, recording 138 megabytes per second (MBps) in both the read and write tests. Typical notebook hard drives generally don't get a write speed that high. It recorded a rate of 60MBps in our file duplication test, which is also a very good result for a hard drive. A 24GB solid state drive is also installed to act as a cache and the cold boot up time of the unit was 12sec, while the resume time from sleep was 6sec (this is a slightly sluggish result for an Ultrabook though). If you want a Twist model that has a purely solid state drive, then you will have to go for the high-end, Core i7-based model, which cost just under $1700 at the time of writing. An internal battery is installed in the Lenovo ThinkPad Twist, and this battery is not removable. In fact, the Twist can't be serviced by a user to any great extent, at least not easily. However, the hard drive can be pulled out of its bay on the right side of the chassis once you remove its cover. You will only be able to replace it with a 7mm thick drive. In our typical rundown test, in which we disable power management, enable Wi-Fi, maximise screen brightness and loop an Xvid-encoded video until the machine runs out of juice, the battery lasted 2hr 49min. This is a poor result compared to many other Ultrabooks that we've seen. The Dell XPS 12, for example, got 3hr 10min in this test, and that Ultrabook had a Full HD resolution and a Core i7 CPU. 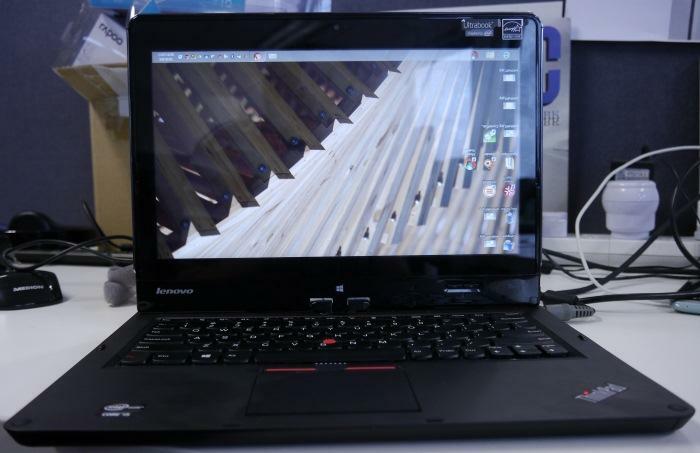 It's a much worse result than the last 12.5in Lenovo laptop that we reviewed, the ThinkPad X230, which got 3hr 47min. For a laptop with a 12.5in screen, a Core i5-3317U CPU and a hard drive, we expected a time of at least 3hr 20min in this test, so what we ended up with is a disappointing result. During regular use, such as using it to browse the Web, type up documents, listen to some MP3s and watch the odd YouTube video, and with a low screen brightness and balanced power profile enabled, the Twist lasted around four hours. As far as other features are concerned, the Lenovo Twist features dual-band 802.11n Wi-Fi (it's a Broadcom chip), Bluetooth, a front-facing webcam, TPM 1.2 and a slew of pre-installed management utilities. You don't get a screen-mounted keyboard light on this unit, nor is the keyboard backlit, but it is a good keyboard if you want to get some serious typing done on a small laptop. The keys are a good size and they possess plenty of travel considering the thin base, which makes them comfortable to hit. Our test model did have a dodgy '5' key though, which must have been damaged by a previous user (we swear it wasn't us). The keyboard's function keys serve secondary functions as their primary functions, which means that you can change brightness and volume without having to hold down the Fn key at the same time, and there are also a couple of new additions that are specific to Windows 8. There is one key that can be used to bring up the Task Switcher (which will save you having to hit Alt-Tab), and there is another key that can be used to take you directly to your list of installed applications. The latter key is a nice addition as it cuts out a couple of steps on the Start screen. Lenovo has continued its tradition of installing a dual-pointing device in its ThinkPads, with a TrackPoint sitting in the middle of the keyboard and above a 79x56mm touchpad. We found the touchpad to be a little bit erratic during our test period. The pointer tended to wobble around a little bit and taps tended to move the pointer off the spot we intended to hit, which got annoying at times. That said, it's not a terrible or an unusable touchpad, it's just that it's not as good as others we've seen recently. It's a Synaptics pad and there are plenty of settings to play with in its driver, but none of them fixed the slight wobble and tapping accuracy. No driver updates were available at the time of testing either. It's also a fairly small pad (79x56mm), which means it can feel cramped when multi-finger gestures are executed (especially three-finger swipes), and it can be easy to accidentally invoke Windows 8 swipe-in gestures. 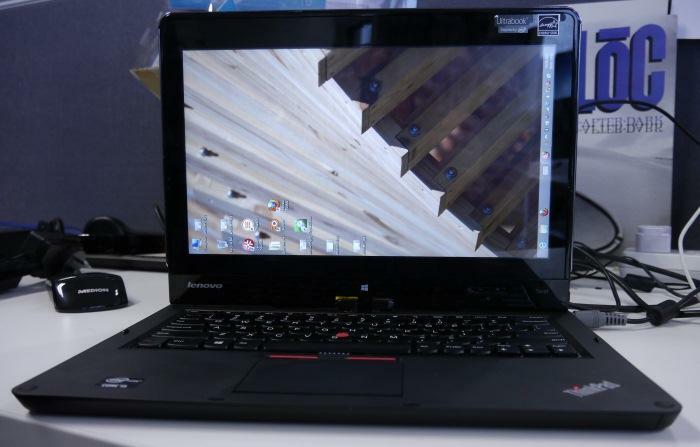 Overall, we like the idea of Lenovo's ThinkPad Twist. The central hinge design is a conventional one that has been around Windows-based tablet PCs for a while and it works well. What didn't work well for us in our tests were the auto-rotating sensors for the screen, which almost never returned the screen back to its proper orientation when we changed from tablet mode to notebook mode. Furthermore, the battery life was short, the touchpad was a little inaccurate and our keyboard had a dodgy '5' key. Unfortunately, these issues have left us unimpressed with this model and we hope that they are confined to our test unit. If you need help using the new Windows 8 interface on a convertible tablet such as this one, be sure to check out our Beginner's Guide to Windows 8. We show you how to use the Start screen and all of the other features that the new operating system offers.